Please visit our new and improved website. Each completed project makes us even more better and professional. As a result we do the best quality we can. Check out our services below. We always do more. Repairs are always less expensive and are less intrusive to your home. We can repair any wood window. Did you know that it’s possible to replace almost any Broken/Foggy Glass? Yes we can do this! Leaking? We provide Silicone/Caulking services to fix your problem. Need a Window or Door Screen repair? Or maybe new one? We can do both. We do all type of windows replacement: Vinyl, Wood (Any Brand), Aluminum. Get your new Windows/Doors with Great Installation. Also We do French/Patio Doors, and Storm Door Replacement. Have Arched window with Broken/Foggy glass? Or any Rotten Wood on it? We can repair it all ! Over 458 extremely satisfied customers! Timely, professional, great communication, open-minded, knowledgable, efficient, and quality work. We are very pleased with the wood trim addition to our island, removal of an old countertop and painting of the unit. We will be using Ardmor again in the future. Thanks guys! Great job by Mike and his team for window replacements. 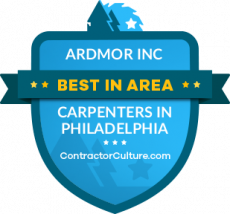 We have referred twice already to other neighbors and Ardmor, Inc does a fantastic job. Very Professional, Quality of work was excellent, Reasonably priced and skillful in what they do. If you need to fix windows, rotten wood fix, these are the guys to go to.